This week started spectacularly, and crumbled a bit at the end for me, which is why I’m going to start with the end of the week, so that when you finish reading this, you will be reminded of the good, and not the bad. Yesterday, we came home to Jacmel from the Savanette. By the time we arrived, I was already pretty tired and looking forward to a day off. However, before I had even entered our yard, I was told that one of our puppies (our dog Baloo had a surprise litter in August) could barely stand. Mandarin, one of the girls, was laying on the porch and having troubles lifting her head, so I sat with her for a while and helped her to take in some food and water. Once she did, I was able to get her standing and walking a bit, so I thought that maybe she would recover well. I finally walked inside our house, only to find a little puddle of dark brown water waiting for me under the freezer… The last time that happened, Jamie & I had returned from a week long trip to the Savannette and discovered that everything in our freezer had defrosted and rotted while we were away, so I was definitely not looking forward to dealing with the mess again. Thankfully I had a meeting to get to, so I left the freezer to wait a little longer, and headed out. When I returned a couple of hours later, Mandarin was much worse than before, so I tried calling the local vet. Sadly, by the time I was able to get a hold of him, she had taken a turn for the worse and passed away before I could even get her loaded in the car. By this time it was already 11:00 pm and I was completely exhausted. To top it off, I realized that even if I’d had the energy, I couldn’t bury her because we had left all of our shovels and picks in the big truck back in Savannette! I wasn’t sure whether to laugh or to cry. In the end, I ended up wrapping her in plastic bags and sticking her in the freezer for the night, since I already knew I’d be throwing everything inside of it away. Which brings me back to this past week. I know many of you may have been reading the updates throughout the week, but this post will be more of a recap of it all, and a description of the work moving forward. Last Saturday, I hit the road to go to the Savannette with my guys, not really having a plan of exactly what we were going to do. I went with 4 tarps, and tools to do whatever we could. By the end of the week, one tarp was on the clinic, one tarp went with Smiley to his house, one went to Reginald so his family can move back home instead of staying in the MIA guesthouse, and one went to Joanes, who randomly came out to meet us. 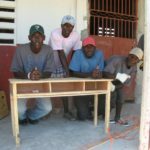 Joanes is a carpenter from here in Jacmel who uses our tools and workshop whenever he has furniture to build. He’s a great guy, and his family lost their home out near Torbeck, which was quite close to where we were at. He came to visit us, and I was able to give him a tarp and an advance on building a kitchen table for us someday in the future, so that he could help his family right now. 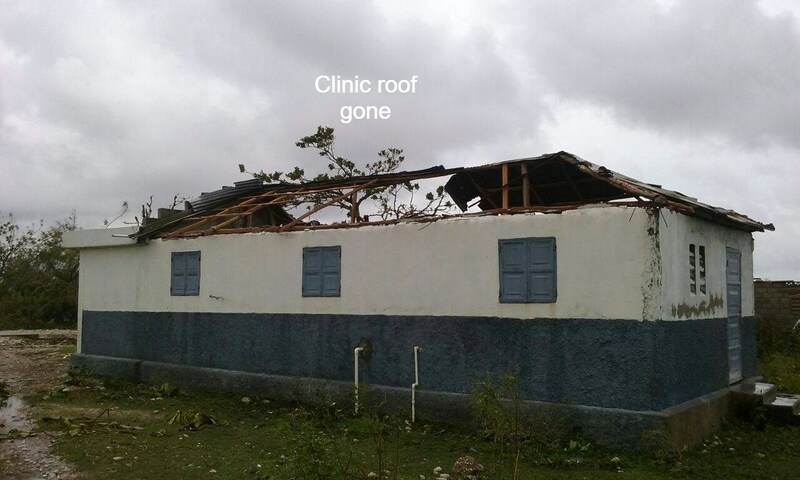 Since that was all the tarps we had, our initial plans were to (a) clear trees, and (b) get the clinic back open to treat any medical issues that may arise in the community. Each morning we loaded up the truck with guys, machetes, and our chainsaw and worked from about 7-12, which is when it would get too hot to do much more. Our priorities were trees that were blocking the road or were on houses, so for now, we skipped many large trees that will need cleared someday, so that we could get the most important things done. 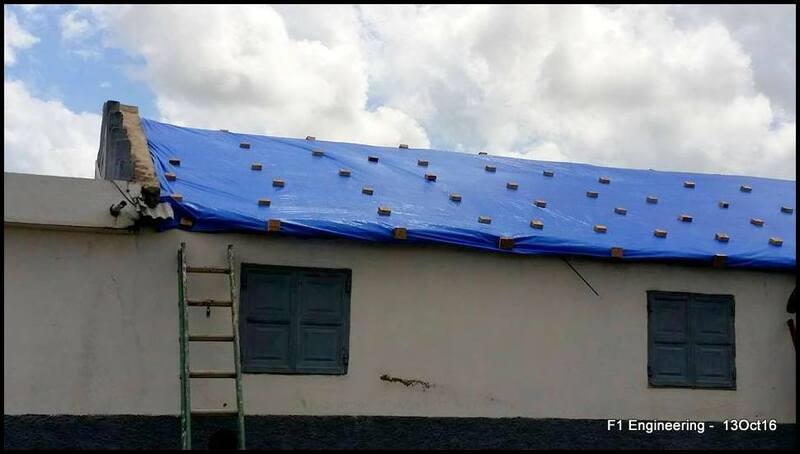 In exciting news, we did manage to build temporary rafters and get a tarp secured over the clinic before we left, so it should at least be able to function again. Securing the tarp on the clinic roof. In the afternoons, I started surveying the community, and by the end of the week (with lots of help from Gala Calisto), we managed to survey about 80 houses and identified some of the greatest needs in the community. 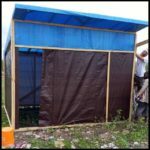 Out of 80 houses, over 70 need tarps. When Gala and Susan Frame came to help from Jacmel, they brought with them 30 more tarps, which we handed out to where we felt were the biggest needs. Honestly, handing out tarps was more exhausting than working with the chainsaw crew. Even though the ones receiving them were quite grateful, it was difficult to not be discouraged by the amount of people surrounding us, creating problems for us by demanding a tarp for their house, or accusing us of breaking promises (which we never made, as we were clear to state at each house that we could not promise anything at all and were only collecting information for now). 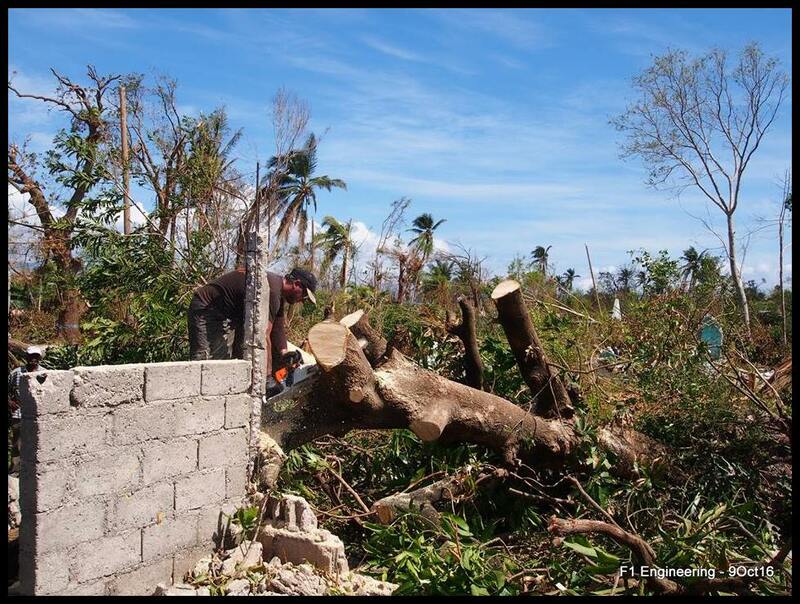 It’s part of the reason we are short on pictures from the survey and tarp process, because we didn’t want to take photos of any houses that we could not give aid to while we surveying, and because we were too busy to get the camera out during the distributions. 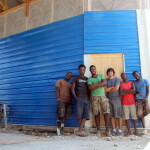 However, we did at least manage to capture a picture at the one house where we actually helped put the tarp on. 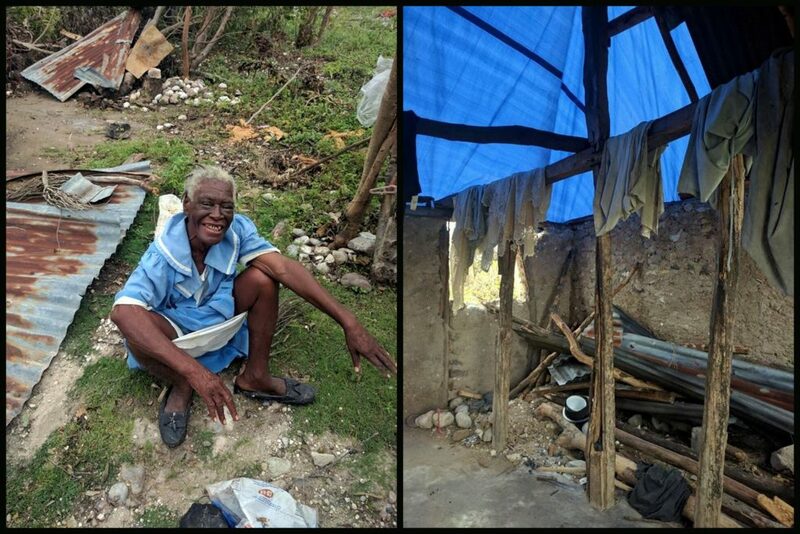 Gala had noticed that this woman did not seem to have anyone to help her clear the rubble in her house, so we figured she would need help putting the tarp on as well. Her house was actually in better condition than most that we gave tarps to, but we were trying to pay attention to who had family helping them out as well as evaluating the house itself. Honestly, though, the struggles of tarp distribution were completely expected and understandable, and everyone did eventually calm down and respect our decisions. And as we left on Friday morning, they thanked us for all the hard work that was put in, and made sure we know they’re are looking forward to us returning in the future. Looking forward, I had a meeting with some of the local supporters here in Jacmel last night. 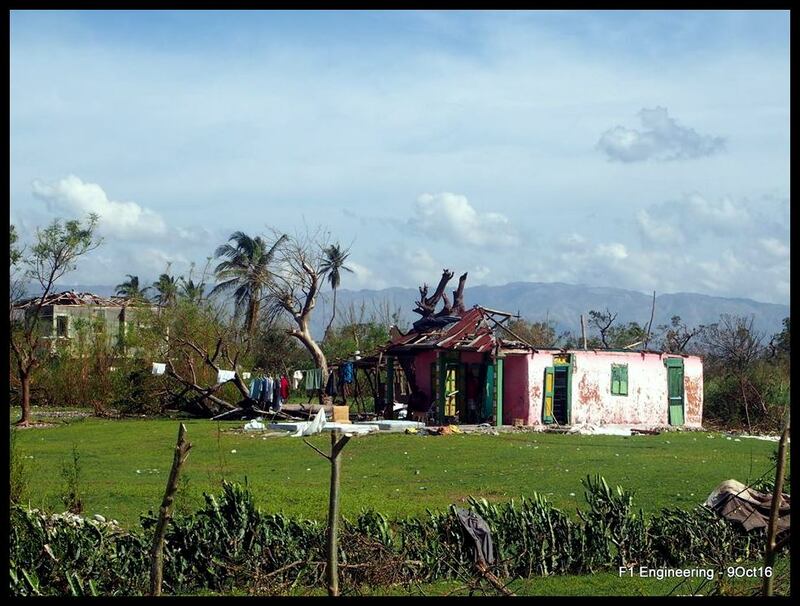 Gala, Susan, and Matt and Julie Reichard (from Carlisle, PA, working with Freedom Global Outreach) have been very supportive and are contributing financially to this relief project as well. We decided that this week would be set aside for rest and logistics. 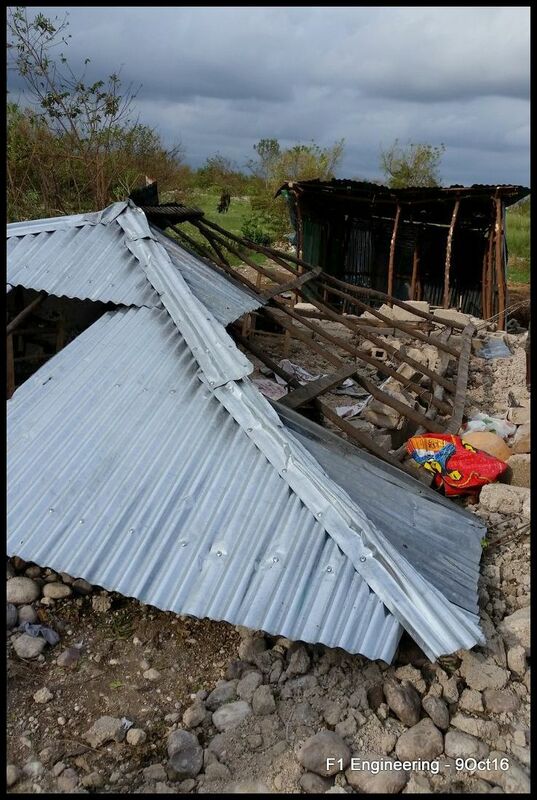 We are searching out prices for lumber, tin, tarps, and some school supplies, as we noticed that many of the childrens’ notebooks for school were destroyed by water damage. 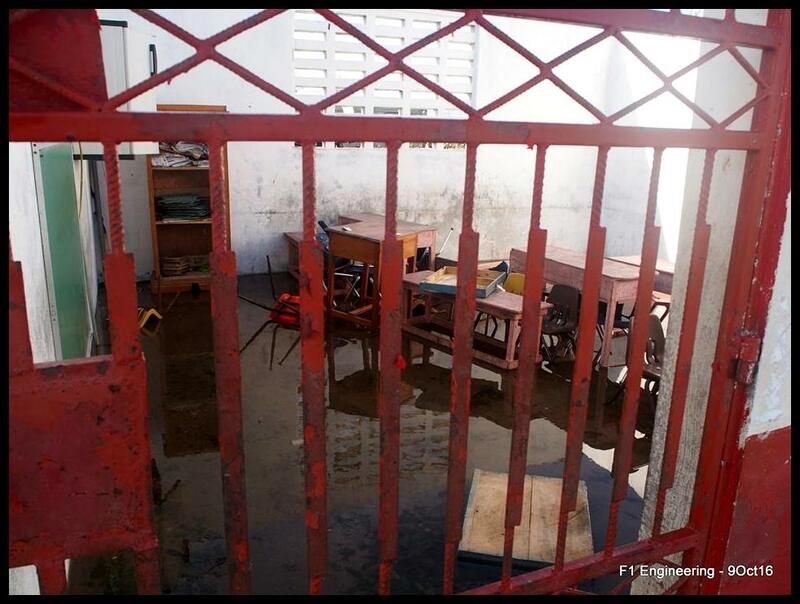 Flooded Classroom at MIA School. I also talked on the phone for a while with my brother, and have been in contact with Kim Conrad, as both of them are planning to come down here and help out with the relief work. I will actually be trying to get to PA next week to see Jamie and Mara for a bit, before getting back into relief mode. Due to the need to rest and recoup, I will not be making it to all the churches and groups that support us while I am home, but I will be announcing one evening when I will be sharing what is going on down here. It will most likely take place at Crucified Church, though I don’t know what night yet. The following week, I will return to Haiti and a small team from Johnstown will be joining me, including Jeremy Barclay, Josh, Sean, and a possible fourth person, who is currently trying to get time off from work. Unfortunately I can’t take anyone else right now as our Isuzu will only carry 5 people with luggage from PAP to the Savannette. – Get more tarps. 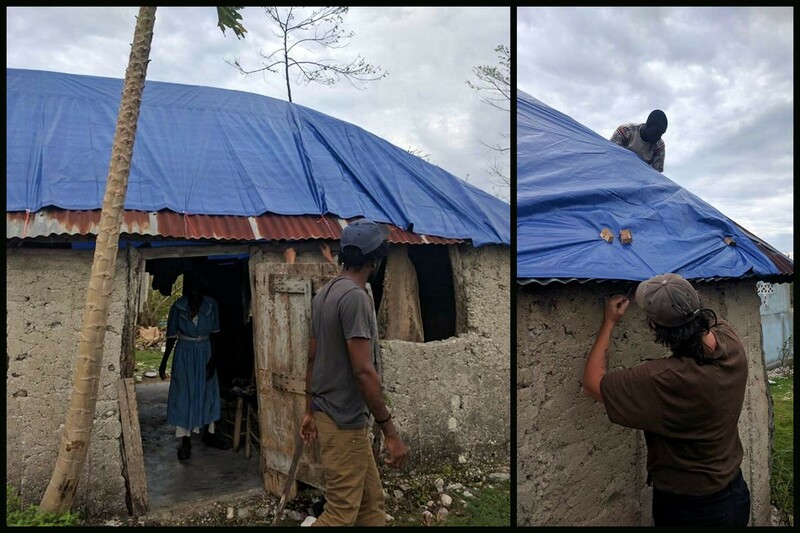 We hope to bring at least 100 tarps to the community for distribution, because that is the fastest and most economical way to address the need for rain protection in the houses. 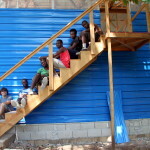 We’ll be buying tarps in Port Au Prince for ~$22, and will add some materials to tie the tarp down into place. 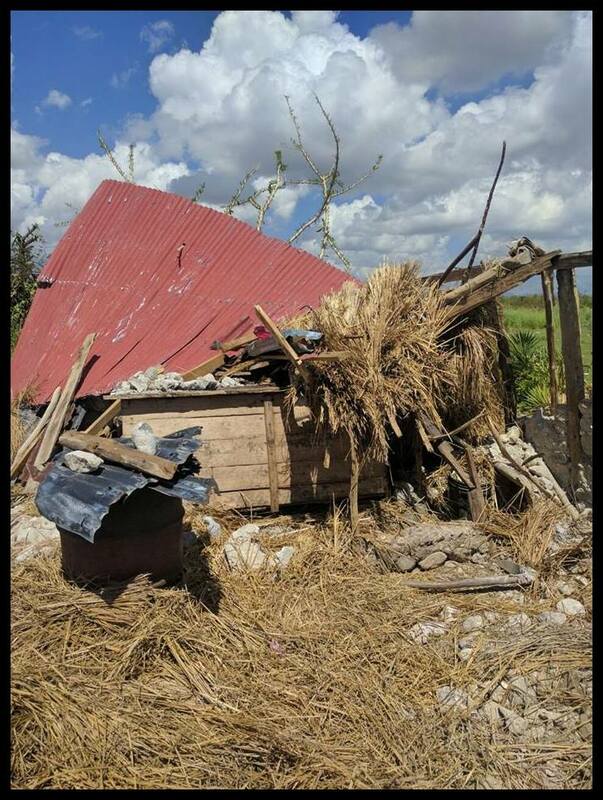 If any of you would like to help sponsor some materials, $25 will get a tarp on a house that already has rafters in place, or about $60 should allow us to get lumber to put up supports under the tarp as well. – Put a permanent roof on the clinic. 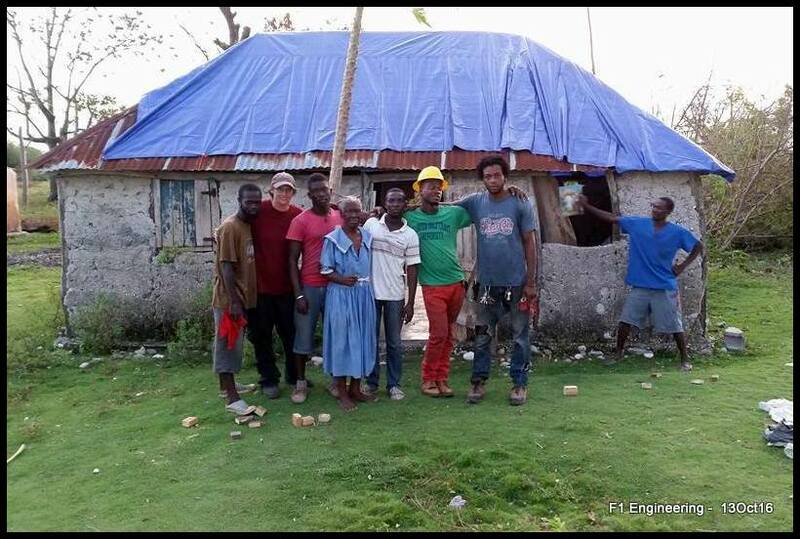 We have a structural engineer designing a truss layout for the clinic, so the plan is to build trusses and get the permanent roof in place before Dr. Jay arrives with a medical team on November 12. – Continue with the tree cutting. 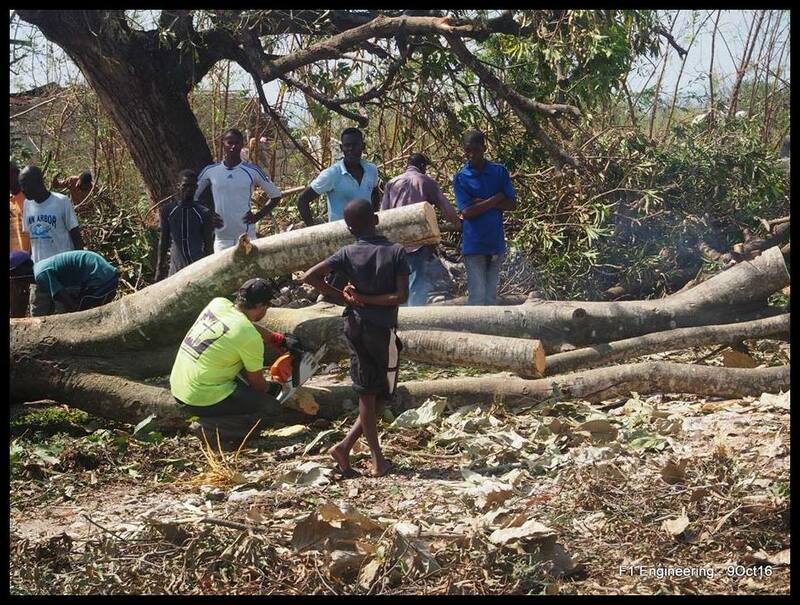 We will be sending out teams each morning to cut more trees, but now we will also start hiring our machete crew instead of taking volunteers. 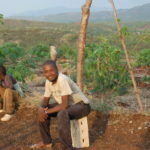 These people need income, so we want to sponsor them to work on a project that will help their families and their community. Paying the men will probably be about $10/man/day if you would like to contribute to that as well. – Re-evaluate the community needs. 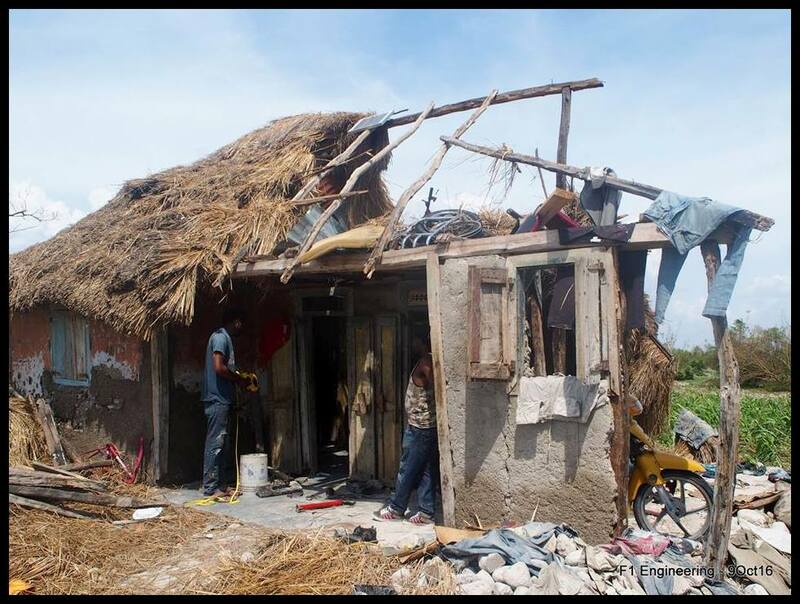 After we have taken a week off, we will get a chance to see who has the means to rebuild themselves, and who does not. Those who are capable of working, will already have started to do so by the time we return, which will help us to identify those in the greatest need. We will certainly not be promising anything to individuals yet, but we have plans that we could build a secure 8’x10′ single room building for about $450. The hard part is that the same money could tarp 18 roofs, or pay for 45 man-days of labor, so we will have to see a significant need to decide that an individual needs a new shelter. We will also keep an eye on the health and food supply of the community, as they are currently not a problem, but either one could quickly take a turn for the worse. Cholera is popping up in some regions which could cause disastrous results, and most of the agriculture in the area was decimated, so the food supply may see a significant reduction soon. Pray that neither of these situations arises, but, if they do, we will respond accordingly. – Minister, not just work. 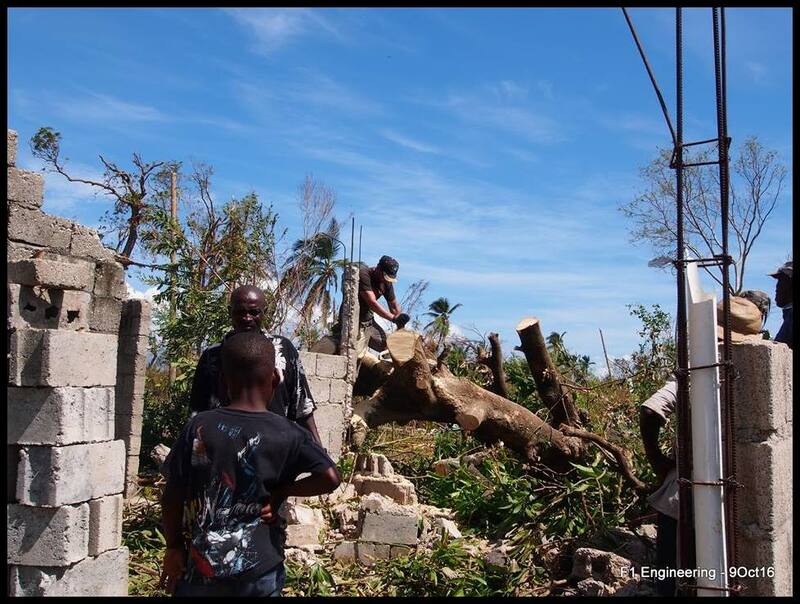 I have reached out to Pierre, our pastor here in Jacmel, to see if we can get a couple people from our church to join our team with a focus on talking to residents and addressing their spiritual needs in this traumatic time. Please pray that God would send the right people for this job as I feel that having Haitians minister to Haitians will be even more effective than if our team tried to do it through translators. When Josh’s team leaves, I will be picking up Kim Conrad the following day at the airport and we will return to the Savanette to continue working. This will also be a convenient time to resupply. 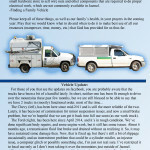 The details of what we will work on will depend on the outcome of the previous week of work. We will look to collect some things in the US while I am home, but I won’t know exactly until I get there. 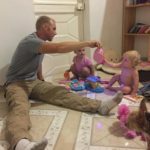 If you are interested in helping, right now finances are the biggest support we need. 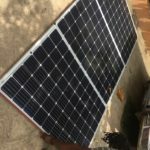 We will use it to buy materials locally since importing things is not only slow and expensive, but this way we support the local economy as well. 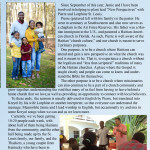 Thank you for all of your support, and for taking the time to read these scattered thoughts… We need your prayers for the Savanette, and for wisdom and strength for ourselves as we continue this ministry. 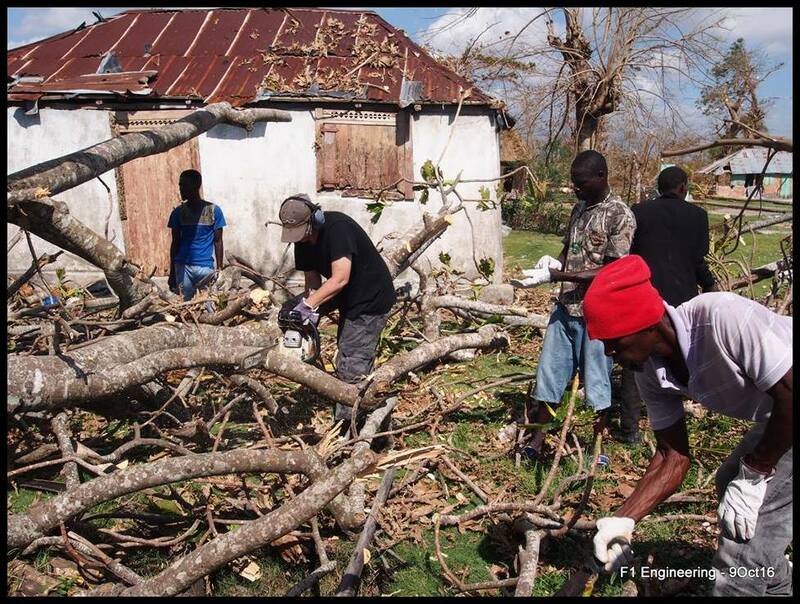 We’re 3 days into our disaster relief work in the Savannette area. Each day we’ve started at about 7am and cut trees until noon, by which time the heat is unbearable enough to force us to retreat (and recover) for a couple hours, somewhere safe from the sun’s beating rays. We’ve been working hard to clear roads and chop down trees that fell on top of houses first, since that is a high priority. I can see that this task is going to take a while, so the chainsaw as well as plenty of manpower are going to be needed for a long time… I’m already thinking that once we get to a point where we have the roads cleared and trees out of people’s houses, it may become an avenue to hire some of the local men to work with us to continue cutting up the fallen trees. On the topic of roofing, I am excited that a structural engineer has offered us his expertise and is currently working on plans for a new roof truss for the clinic. We’ve also had word of a donation coming in to help with buying supplies for it, which is wonderful news as well. There have been several mild injuries around here that could become infections if not treated, so we want to get the clinic functioning again as soon as possible. The engineer is also going to help me work up what rafters should look like on the various houses that are broken, as I would really like to make sure that any roofs we end (re)building are strong and sturdy. Many people would like to restore their damaged houses, but I must admit that I’m scared to rebuild a house whose concrete blocks got knocked over in the wind. However, I also probably can’t convince them not to rebuild it the same way (at least not very easily), so I’m trying my best to come up with modifications that would at least make the structures safer, while still using some of the same building methods they are used to. Speaking of which, we will need to buy lumber and tin soon. As we’ve been cutting, we’ve tried to keep our eyes open for any wood that we could scavenge, but I’m beginning to realize that it’s not a practical plan. Turns out that most of the trees that fell are terrible for construction because the are too soft. 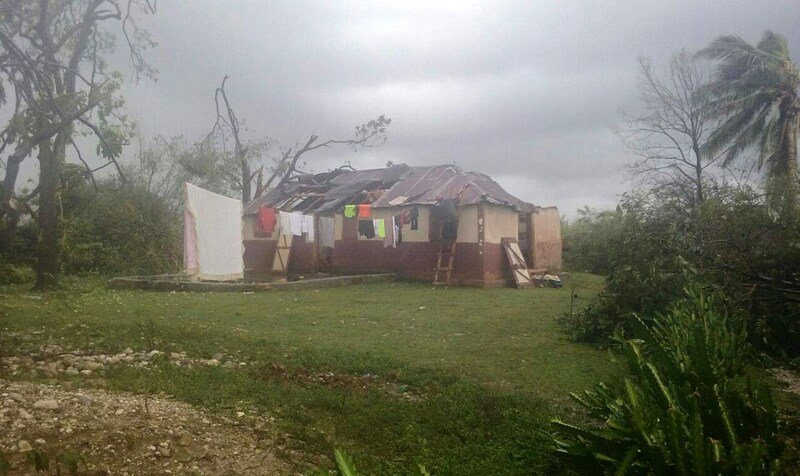 I also have yet to come up with a solution for the people whose houses were completely decimated, but I am working on getting prices to try and do at least small wooden shacks with tin walls as temporary shelters. In other news from today, just as I was leaving to drive down into Les Cayes to get internet, we finally received reinforcements! 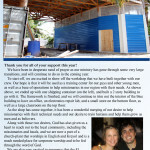 Susan Frame and Gala Calisto had driven out from Jacmel to help us out a bit and deliver much needed supplies. So now we at least have some tarps, nails, roofing screws, etc. 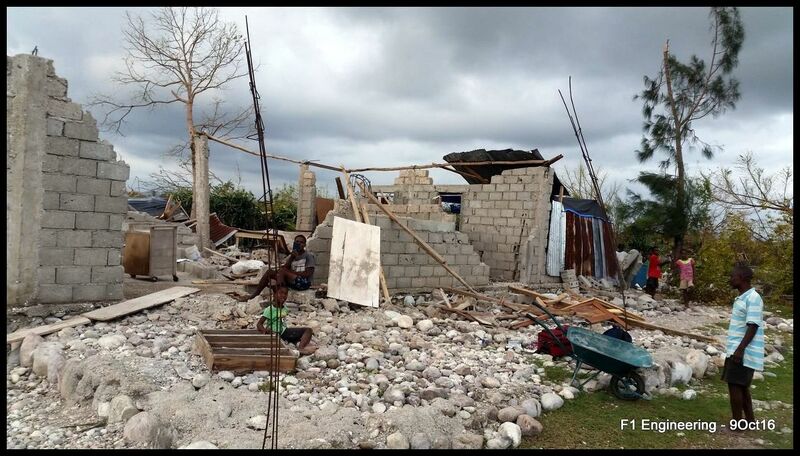 The plan is still to try and split into 2 crews, with one team working on tarping houses, and the other continuing clearing roads, while I send Gala to talk to the community and survey more houses for damage, since she speaks Kreyol much better than I do. Aid is a very tricky thing though. As I surveyed houses these past couple of days, I encountered a wide array of reactions. 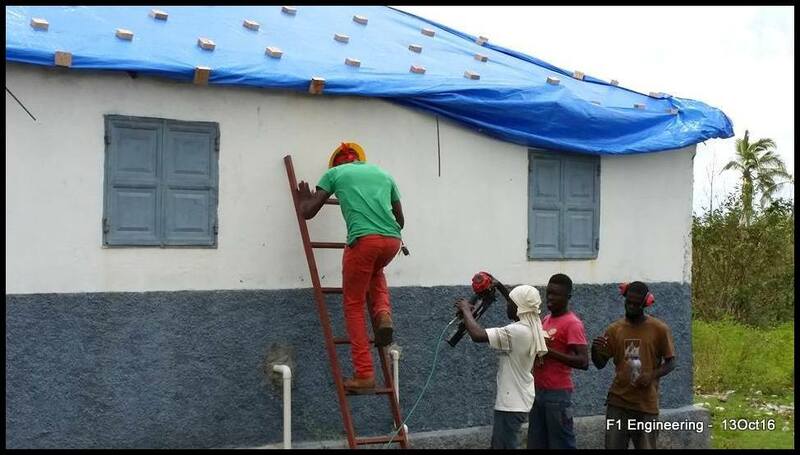 At each house I would explain that “we are here to help”, but that we came with tools and manpower only, and that “we have few supplies and cannot give new tin roofing to everyone”. 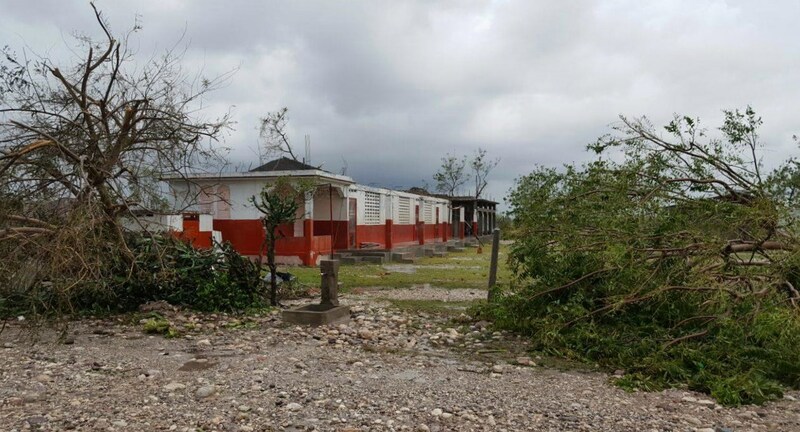 Surprisingly, some of the worst reactions I got were from people whose houses weathered the storm the best, as they seemed to think they are entitled to free supplies. 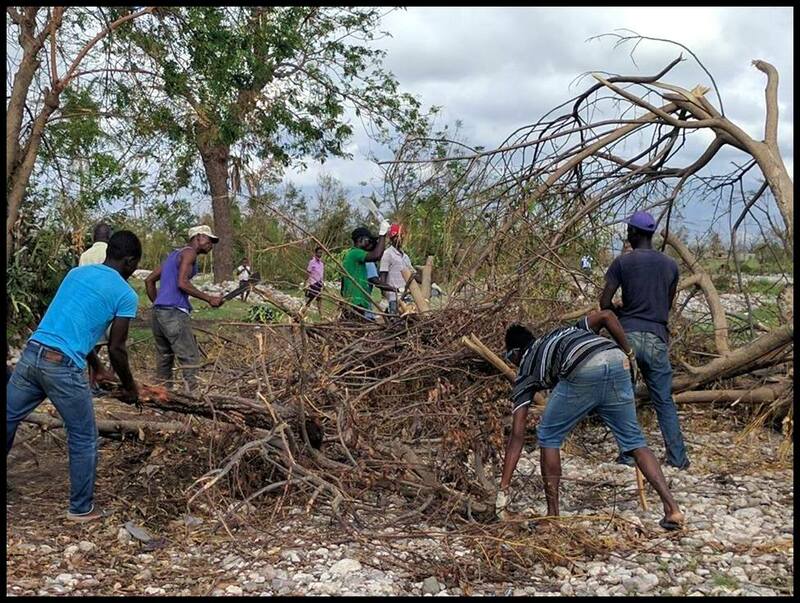 On the other hand, some of the best reactions came from families whose houses were flattened and were glad to have any help at all come to the area. We have been quite clear to everyone that we came with little, and we can promise nothing, but what we do have (tools and manpower), we will gladly give. Most people are extremely grateful. 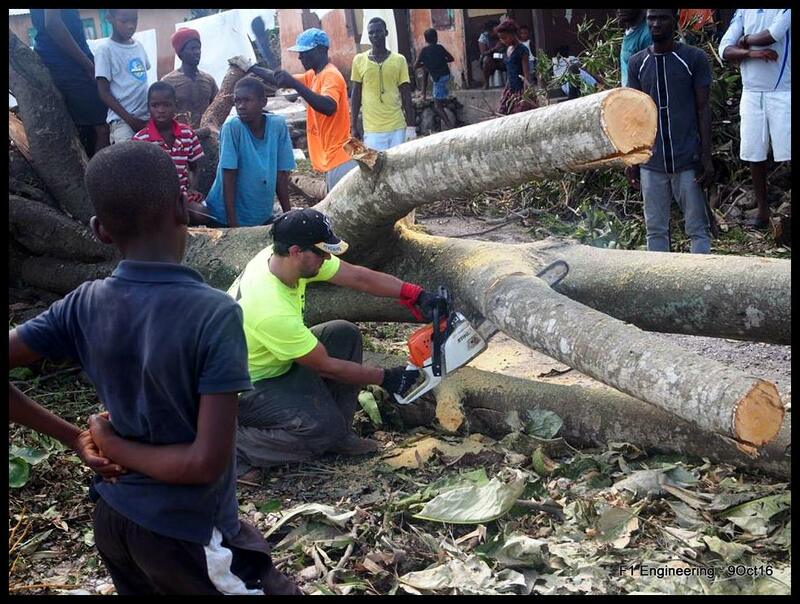 As we were chainsawing today, we encountered a couple who had retired from their work in the US and moved back to Haiti. They had a giant tree fall on their house, which we were able to clear. They fed us bread, water, and even some AK100, which is a Maize-based porridge sort of thing, as a thank you. Although it has been hot and tiring (and still a bit overwhelming), it’s moments like these that bring a smile to a weary (and very dirty) face. It’s kind of funny that since I’m the only one with a chainsaw, I’m also the only one at the end of the day completely covered in sawdust, but it’s all good. Apparently the signal isn’t good down here, and my battery is low, so for the time being, Jamie is playing the role of secretary. Today, we spent a good part of the day cutting trees, trying to clear the road and salvage any wood that might be helpful. I must say I was glad to dust off our old chainsaw which had been sitting dormant for the past few years and finally put it to some good use. We definitely got more work done than if we only had machetes. 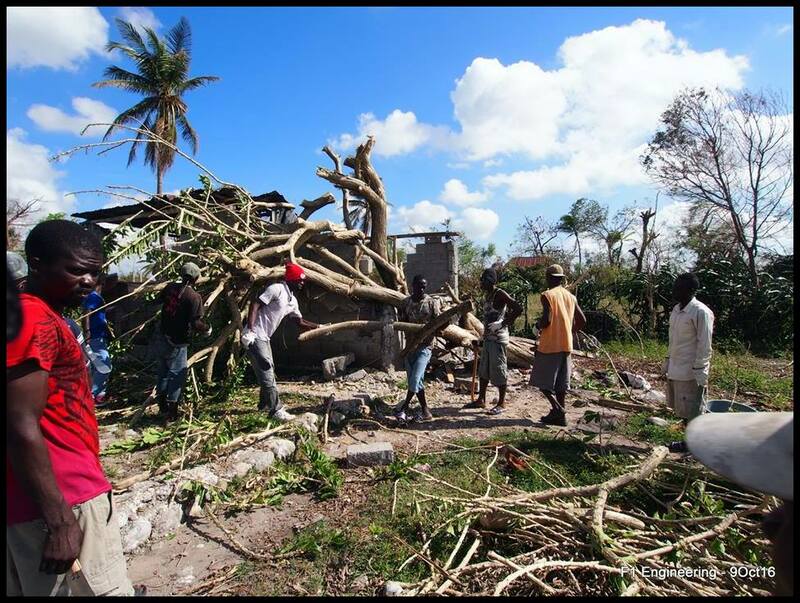 In the afternoon, we were finally able to start surveying the surrounding area to get a better idea of the damage left behind by Hurricane Matthew. From what we’ve gathered, there have been no deaths, but only by the grace of God. Out of the 42 houses we visited, only two were “fine”. 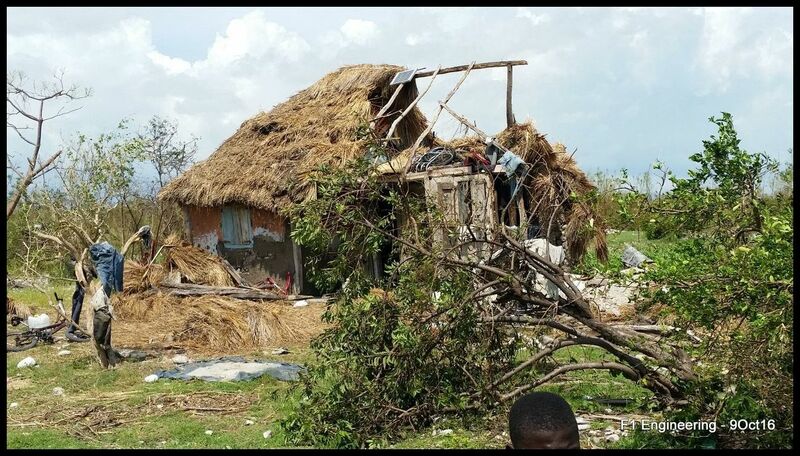 11 of them were completely totaled, with nothing to salvage or even put a tarp over, and the rest of them are in desperate need of roofs as they’re currently unlivable, even for the Haitians. 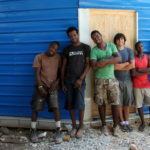 Thankfully, we should have some tarps arriving on Tuesday as two more friends from Jacmel are coming to help us out. 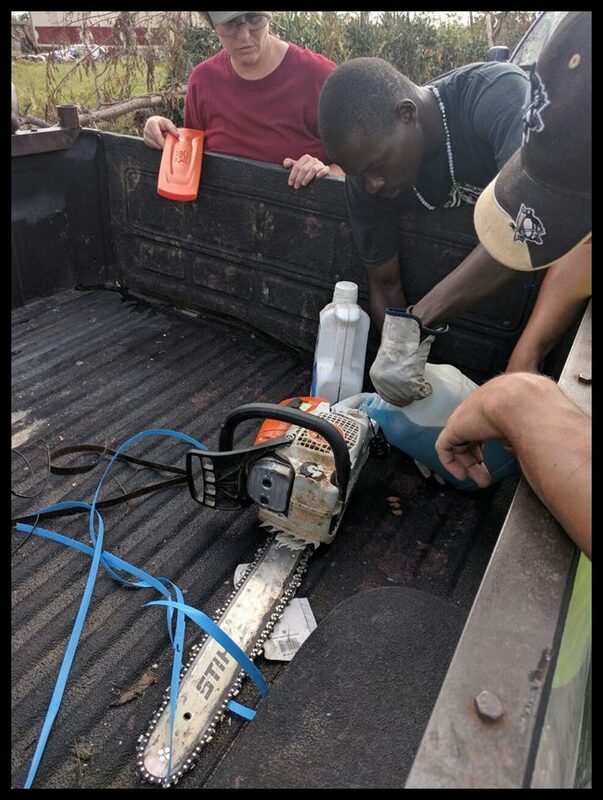 Susan Frame and Gala Calisto will be bringing much needed supplies including machetes, roofing screws, plumber’s tape, nails, peanut butter, etc. The plan is to split into two crews, with one team continuing to survey the community, and the other one degaje-ing some makeshift shelters. 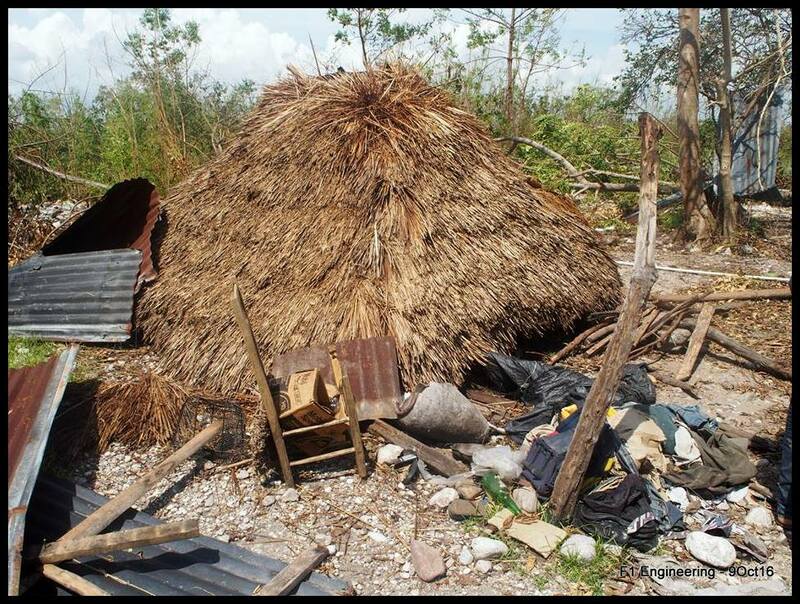 “Degaje” is a Kreyol term that pretty much means “make do with what you have” or “do what you got to do”, which is pretty fitting as we’ll be trying to build some shacks out of the tarps, downed breadfruit trees and whatever else we can find that might be useful. We still have no idea what we will do for the houses that are completely destroyed, but at least it’s a start. I’ll admit, when I first got here, I was feeling overwhelmed by the devastating needs around me. But as I see people (both local and abroad) coming together to support us and this community, I’m greatly encouraged, and reminded once again that God is good, and faithful to provide. 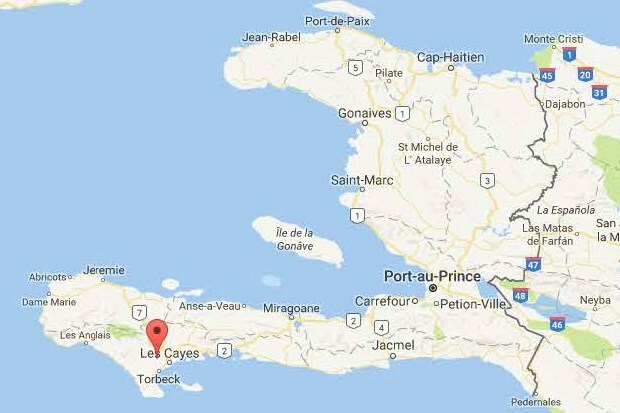 I’m in the Savannette (NW of Les Cayes), which is the first place I ever served in Haiti. 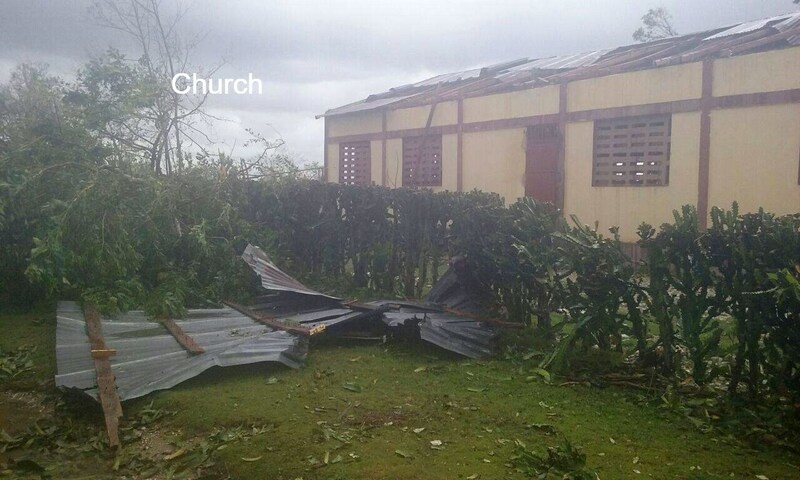 I came here knowing it got hit hard and that the school, clinic, and church lost their roofs. I still wasn’t prepared for the fact that the majority of people lost their entire houses. I could spend a month just doing chainsaw work, but instead, we will start building shelters with whatever we can claim out of the fallen trees. Right now, we need tarps more than anything. Actually, I take that back. We need wisdom that only god can provide. There is no good way to make a priority list. 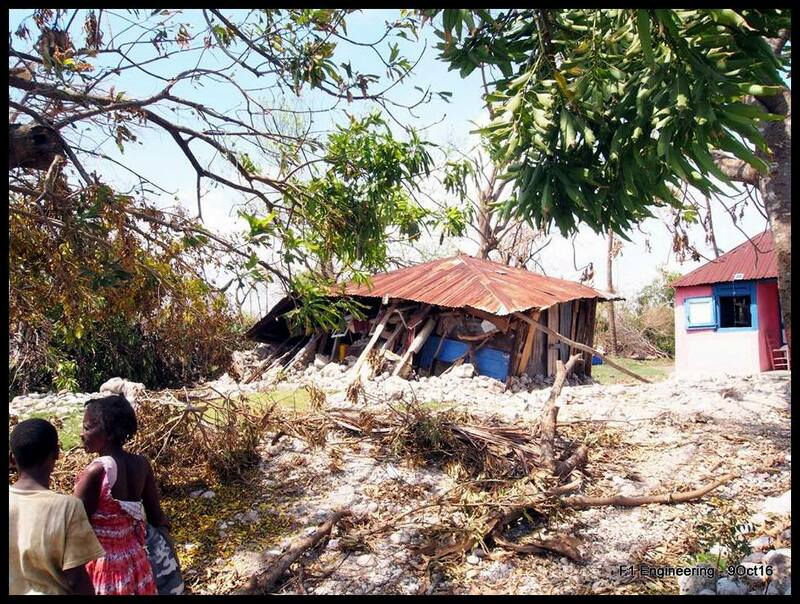 This is not the worst situation in Haiti right now, but, if its left alone, it could certainly start catching up. We also need a miracle. Here I am with 8 sacks of rice, 4 tarps, and some scattered lumber. If Jesus fed 5000 with a few loaves and a couple fish, maybe this can work out, but only by His hand. Give me wisdom, you know just what to do. Today I rode down to the Operation Blessing Headquarters in Tabarre, Port Au Prince. On the drive, we saw some downed trees and power lines, but the roads have already been cleared. 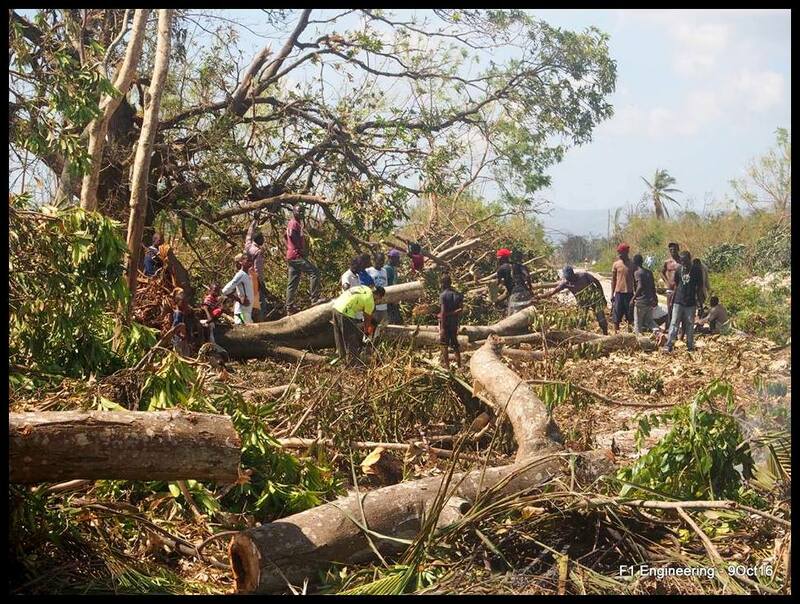 The haitian community is quick to respond, and strong, they can handle downed trees fairly quickly with machetes, and they are doing that well. Port Au Prince looks good (mostly). 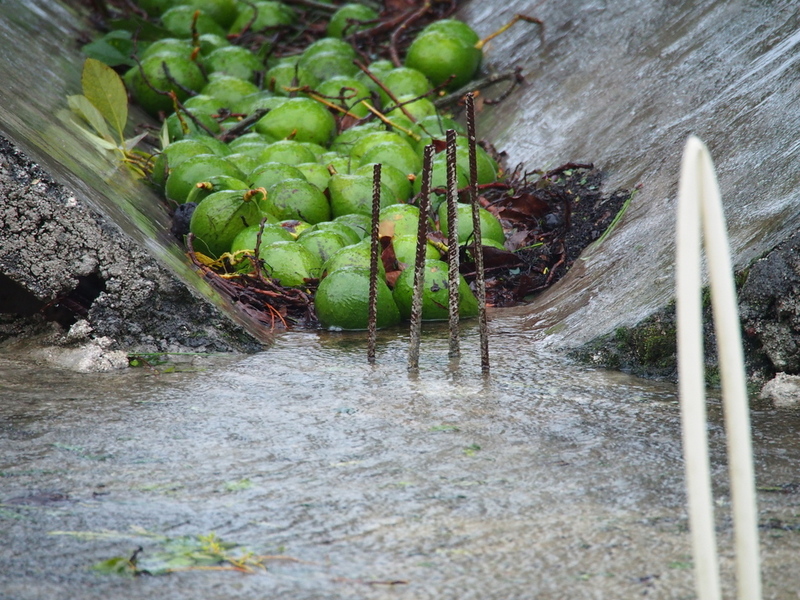 The rivers are quite dangerous and have claimed some housing and property. Hopefully no lives were lost there, but we won’t know for a while. I’ve asked some friends about road conditions and there is flooding in Leogane that would not be passable by car, and that Scott Payne stood at the bridge to Lavaneau for a while (which is passable), but saw no cars coming to Jacmel from the north, which sounds like the road may not be passable, although it could be that no one can even get to Dufort to start heading south. 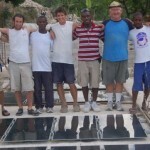 I have checked in with the guys, and read more reports from Jacmel. 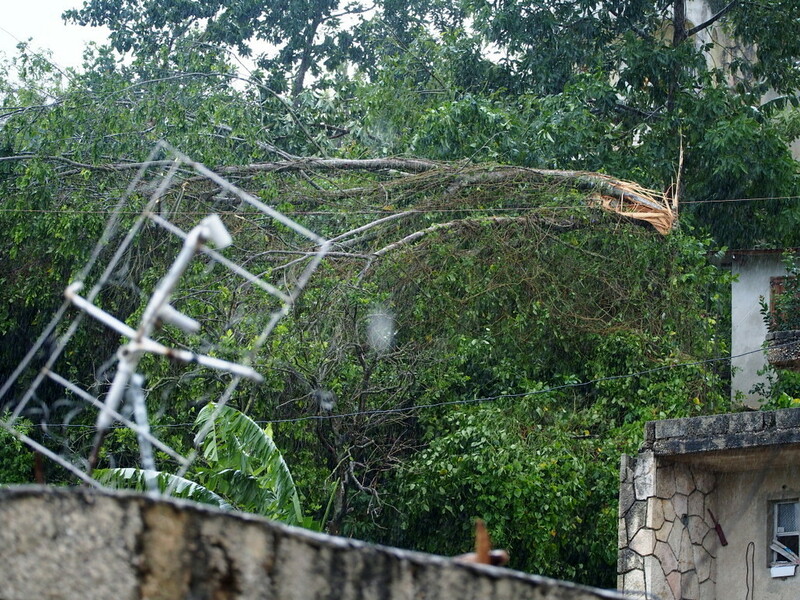 It seems that most things were spared in Jacmel. 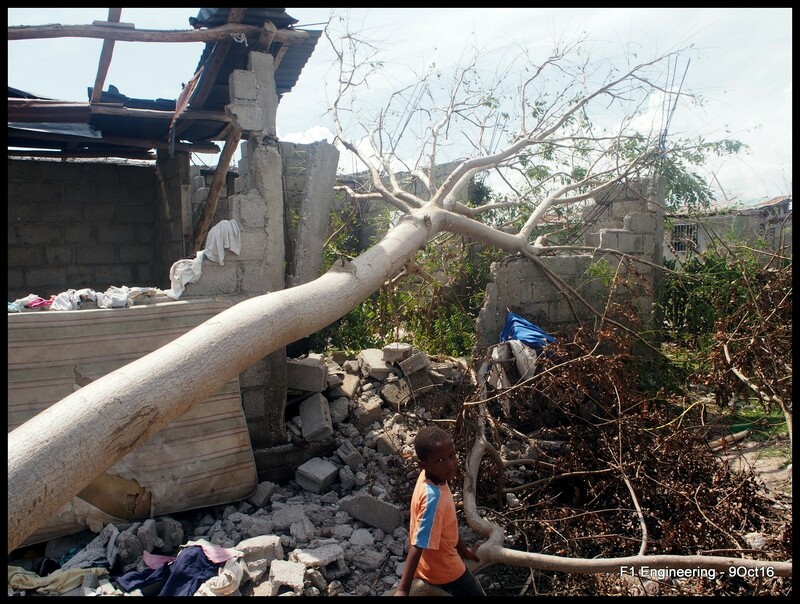 In the words of Waly, God was protecting Jacmel. Kara at Hotel Cyvadier said they survived fine, despite being oceanfront. 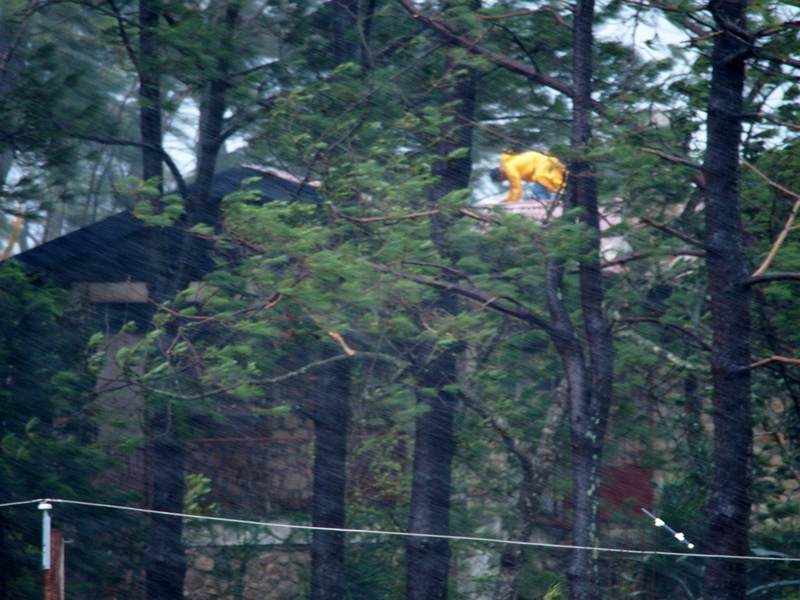 Similar to hear, there are trees and power lines down, and some tin roofing missing from houses. Unfortunately, all of Haiti was not so lucky. Dame Marie has been completely out of communication for over 24 hours, and is completely cut off from the rest of the country by flooded roads. 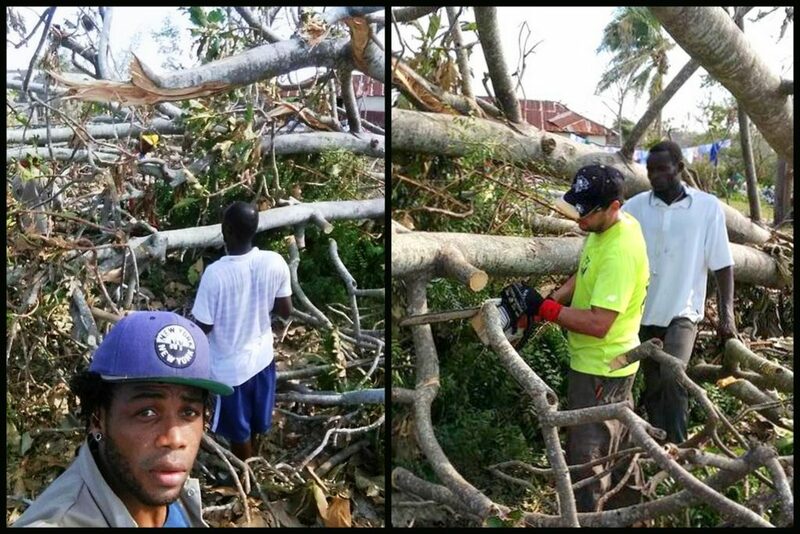 It is a community of 40,000+ that was hit hardest by the storm. 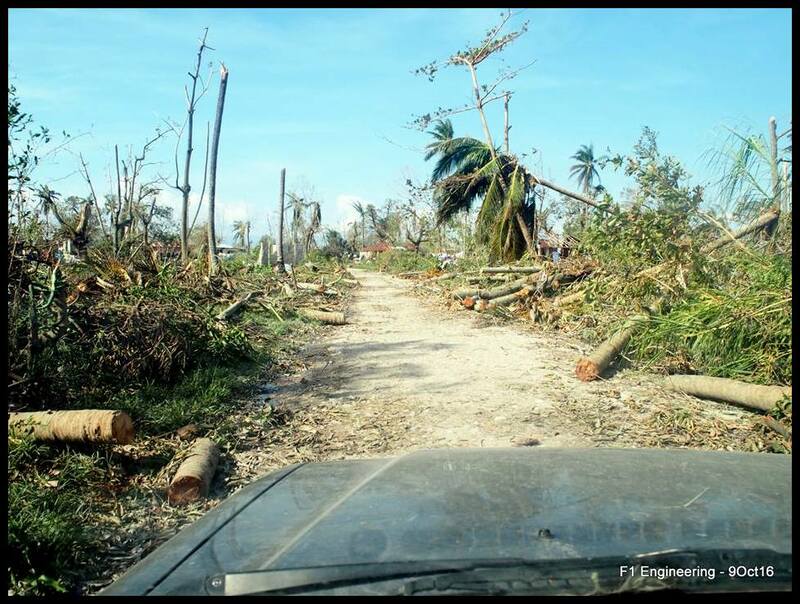 Operation Blessing, MAF, and many other organizations are working on how to get aid out to this isolated and devastated community. I have heard reports of chest high water in downtown Les Cayes, and the river is high, fast, and terrible. 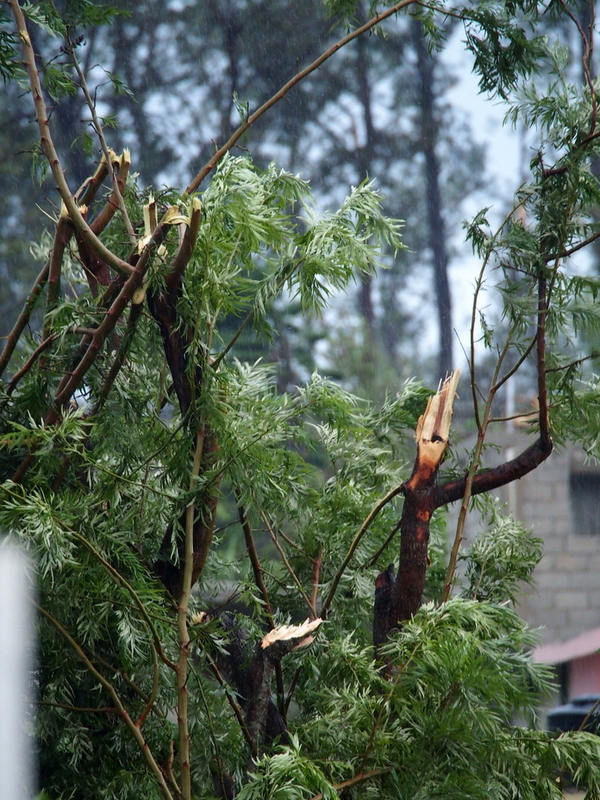 Another missionary said that he thinks every piece of tin in Les Cayes is gone and every tree is down. It may be an overestimate, but it gives an idea of the amount of destruction. Sadly, the road between Petit Goave and Grand Goave suffered a broken bridge, so there is no way to get help by truck yet. Will keep you posted as more is learned. 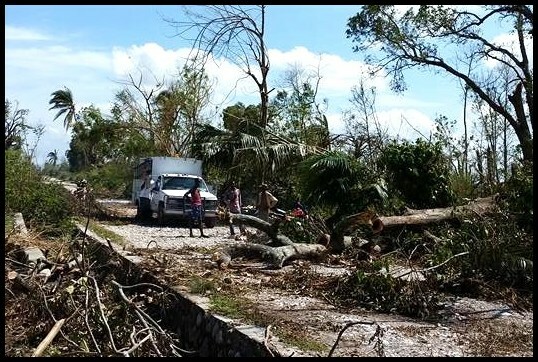 Operation Blessing (www.ob.org) is working on relief efforts from their base in PAP, trying to find a way to get to the south. Maxima is going to start building emergency shelters again, though they run about $3000 per house. They are rated to Cat 3 hurricanes, and have stood well for the 6 years since most of them were installed after the earthquake. We MAY try to work with them in the future, but I’m not sure we’ll have the budget to keep up with the need. We will be working on getting west to help out as possible, hiring our guys as labor to provide relief as we go. It is tricky to update about different places in Haiti right now. 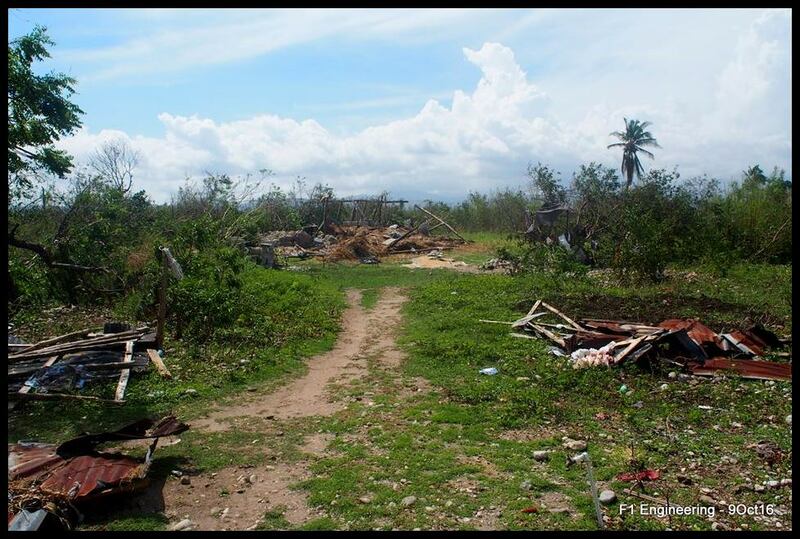 A lot of the information on facebook must be fact-checked as there are pictures being spread from past events, such as Tropical Storms Jaoquin and Sandy, and even pictures from other places, such as Kingston, Jamaica. I THINK all of the following is accurate, but I cannot guarantee it. 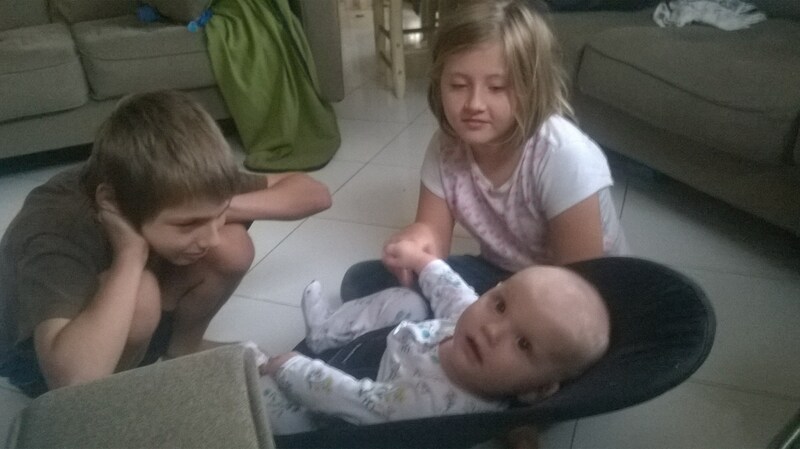 For our family: We’re enjoying our time with the Lotz family. It has been a day of strong winds and heavy rain, but the house is dry and safe. There have been 10-20 trees fall within the view from our porch, including one which had a trunk over 20″ in diameter, but there was never anything that threatened the house we are in. Thank God for keeping us safe through this. 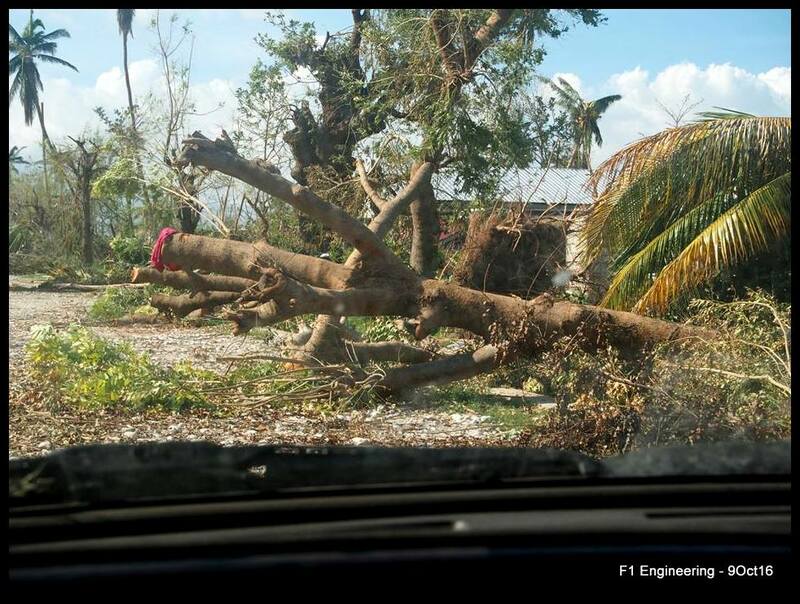 For our guys: At our house, the guys were reporting that everyone is safe, and the only damage that has been reported are to the Almond tree (in the front yard of our house), and the Breadfuit tree (which is by the stairs in the workshop), but neither damaged our property. For Fort Jacques area: This is the area I can speak most definitively about, though I still only know what we saw from the porch. That is many downed trees, and a few houses with roofing tin flying off. This area is mostly large houses, so everything should be easily reparable for the residents, though it made for a cold and wet day. Power lines are down all over the place. 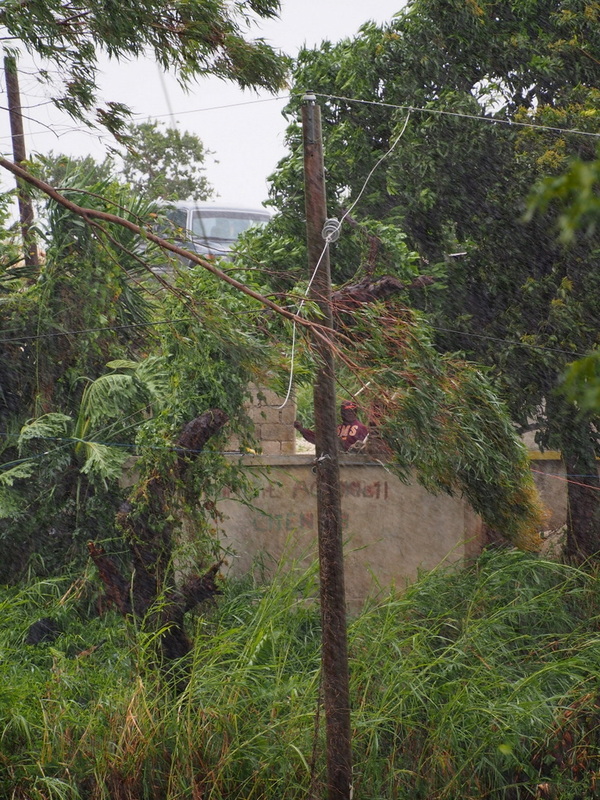 It is a surprising bonus that since grid power was not on, it was safer for everyone when the power lines went down. 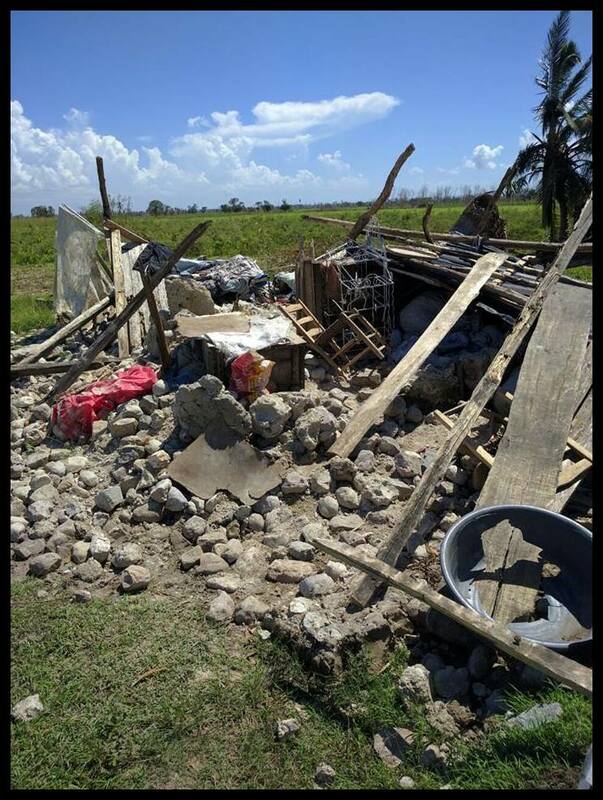 For Jacmel: Reports were moderate all things considered, though all of my reports are coming from ex-pats and what they can see from their compounds. I’m sure once we get out we will find that there was a lot of tin roofing ripped off of houses, and water damage all around. We know that trees were getting knocked down on ex-pat compounds so I’m sure they’re getting knocked down everywhere. Likely there were major mudslides as well, but I haven’t heard any reported. The rivers are extremely high and dangerous, including a large area that is typically marsh/swampland adjacent to Sarah Wallace’s compound. 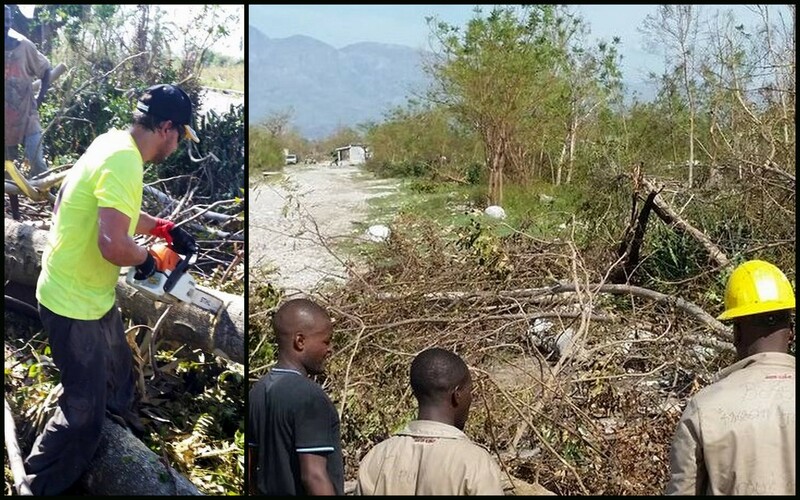 This likely means that Lavalle, Lavanneau, Bainet, and other cities in the mountains west of Jacmel are cut off from supply routes until the water receeds, assuming the (newly completed) bridge has not been damaged. For Les Cayes: I’m hearing bad reports. The river is high and dangerous, cell phone coverage is mostly out, and there is extensive flooding throughout the town. 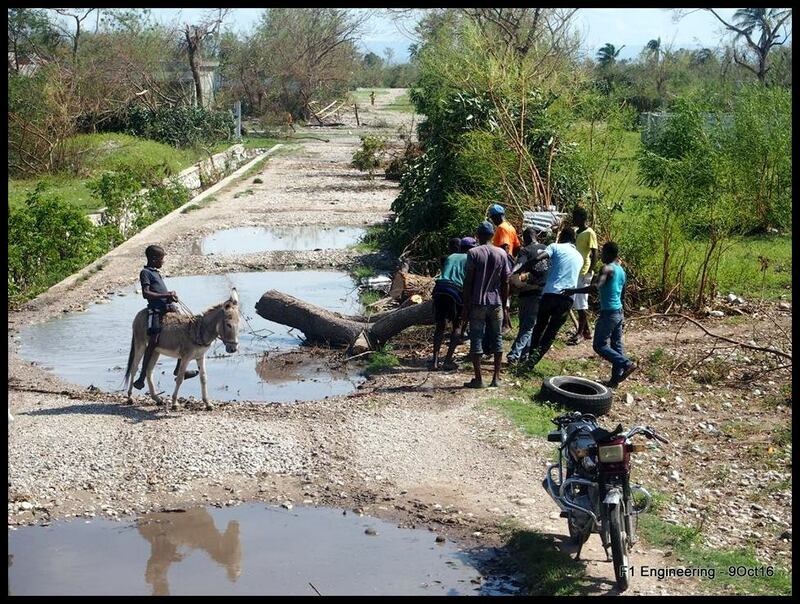 More importantly, there are reports from Petit Goave that a bridge is out on National Route 2. 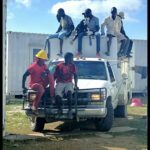 This will mean that everything to the south and/or west of Petit Goave, including Miragoane, Les Cayes, and Jeremie, is cut off from the rest of the country until a safe detour is constructed. I have seen some terrible pictures of flooding, and reports of shoulder-high flood waters, but I have not confirmed them yet For Cote D’ Fer: I haven’t heard any reports, but it is likely isolated at this point completely if Route #2 is out, and the river is impassable from Jacmel. For Grand Goave: All my friends seem to have checked in OK, so that’s good, but I don’t know any more than that. Considering a bridge was destroyed in Petit Goave, which is only one town over, flooding is probably pretty high in Grand Goave’s river as well. For Port Au Prince: I have seen pictures from downtown Port-Au-Prince, as well as the Grise River between Tabarre and Santo, showing extremely high water levels, but I’m not sure of much else. With the amount of rain that has been falling, all lowland areas will be impacted by flooding, and that will be serious. 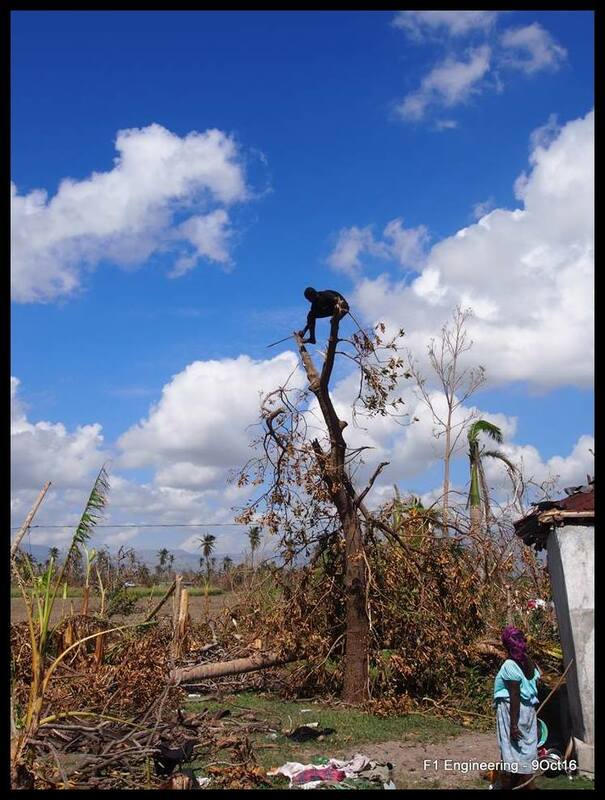 Moving Forward: This could have been a lot worse, but it is still very devastating, especially to the South and West of Haiti, the poorer communities, and the infrastructure. There will be many, many people who lost their houses and their possessions. 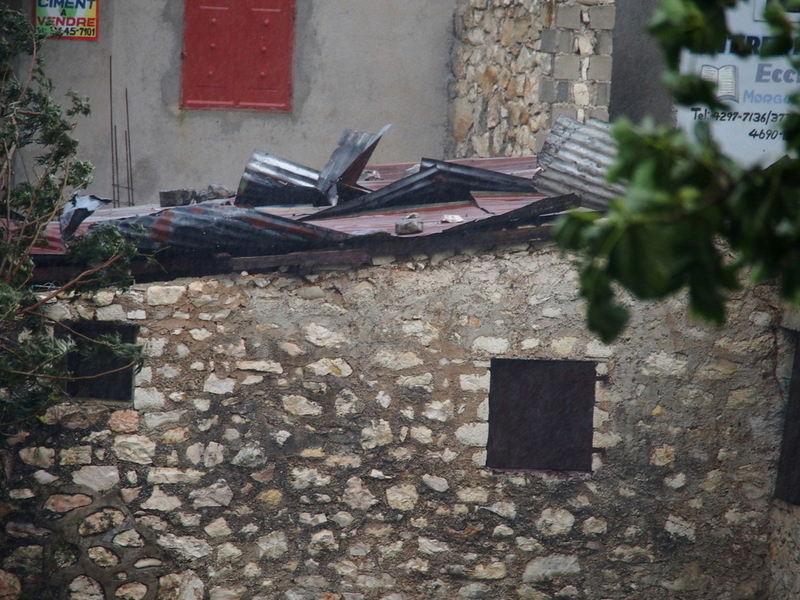 Even more will have had significant damage, such as lost roofing on their houses. Disease, especially the risk of cholera or mosquito borne diseases, will likely jump in the next few weeks as everything is wet and the little “proper” sanitation that existed in the effected communities is likely destroyed. Additionally, clean water will be even harder for people to get. 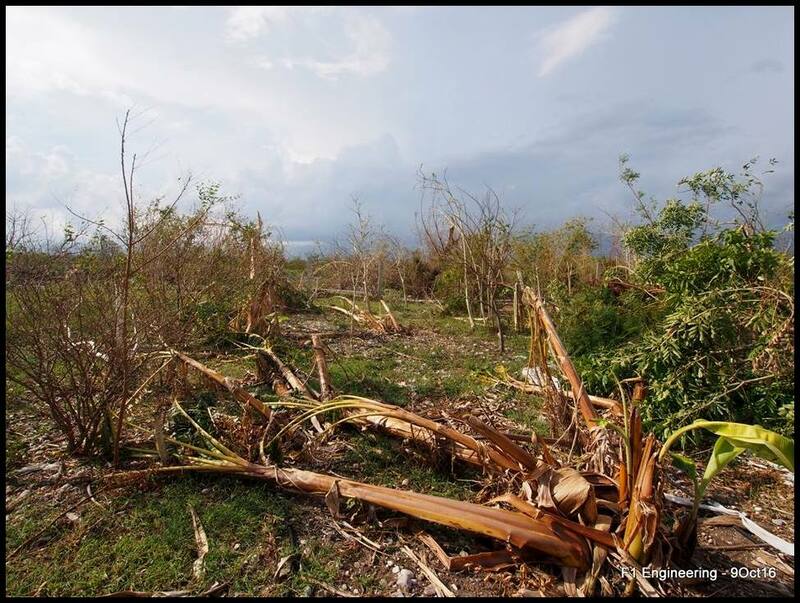 The agricultural community probably lost most of their crops due to the high winds. 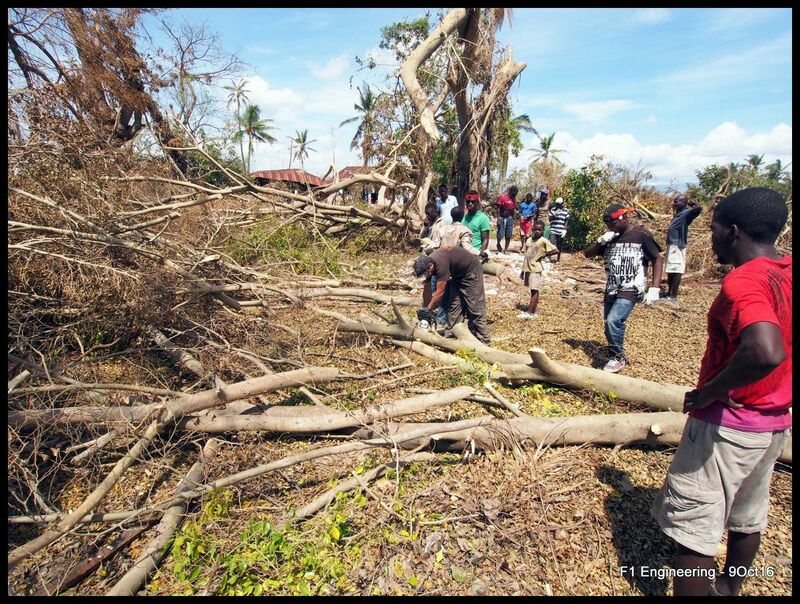 And the lack of supply routes will compound the agricultural problems to cause food shortages, and make getting supplies to rebuild, and even just clear debris, more difficult. 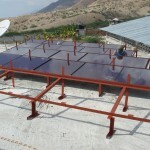 I will try to return to Jacmel as soon as possible. Probably the roads will not be passable yet, though I can’t be sure. If they are, that is awesome. If not, I will try to catch a plane down there when the airports are open. At that point, we’ll get the house secure enough for Jamie and Mara to return, then get to work clearing roads and helping people dig out. Relief teams would be more needed in the South and West. It would be premature to plan them until more evaluation is done. Financial support will be needed for all organizations that are working in Haiti to recover quickly, and to help their neighbors recover. Smaller organizations tend to be the most efficient, and the fastest, at distributing funds. Many have learned lessons after the earthquake on how to respond most effectively without undercutting local business, which combines the economic issues. For example, it is important to buy local to get money back into local hands and allow those people whose businesses survived to rebuild and help their neighbors to rebuild. 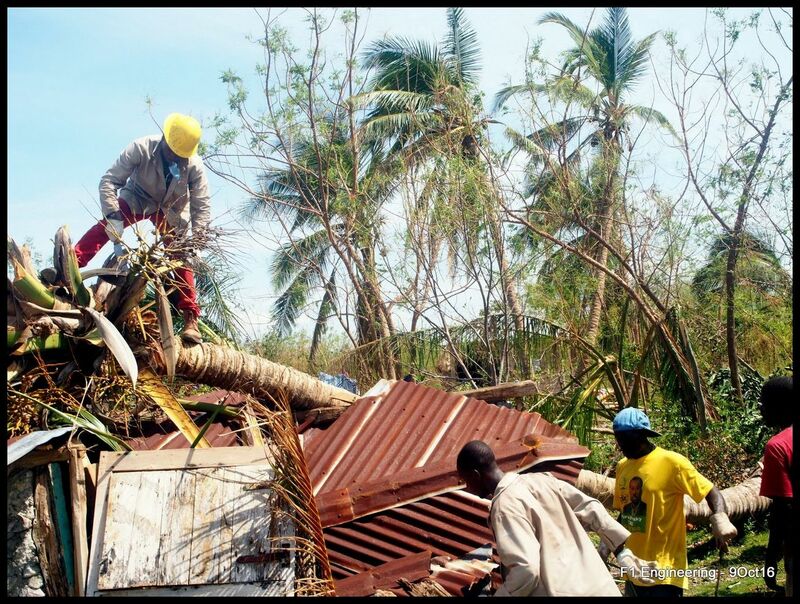 Additionally, it will be best to hire locals to do the work, when possible, so that they will have money to rebuild their own places as well. 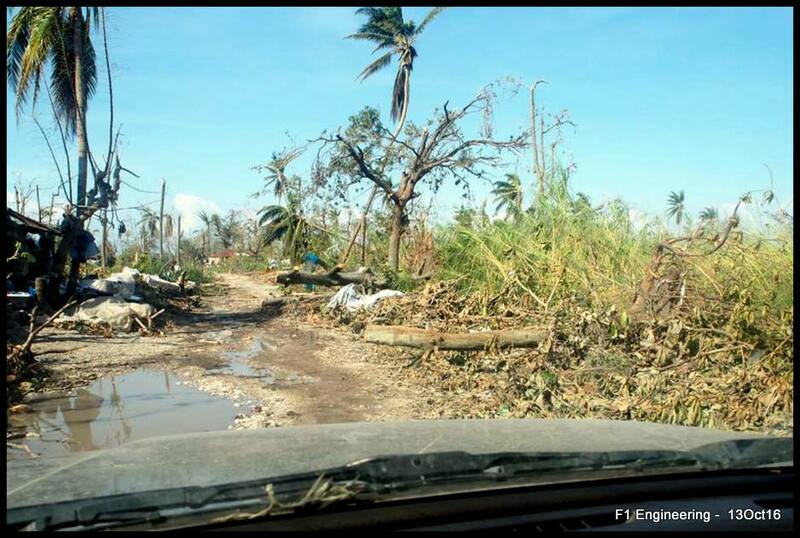 Obviously, at F1 we will use any money as wisely as possible, seeking to help re-establish infrastructure and provide jobs, but I would also recommend donations to Operation Blessing, Mission of Hope International and other organizations working in the South and West. I did have really good experiences with Samaritan’s Purse’s emergency shelters back in 2010, so they also seem like a decent choice to support, even if they are a “big” organization. However, despite landing in PAP at 5pm on Wednesday, I am still in PAP and have not made it to Jacmel. Yesterday, we went shopping, and everything was great on that end. We finally own a 25 kVA transformer, and an air conditioner, which I will work on installing once we get home. 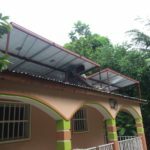 We also picked up solar panels and batteries for some new missionaries in the Leogane area that the guys will start building racks for as soon as we get back. However, Gayly picked me up in the F150, and it needs brake work done, and new front tires, before we head back over the mountain. Thankfully, we still had a place to stay for another night, and I was put in touch with a good shop to get the brakes worked on. It is run by an american and staffed by haitians. Overall, it seems like they are the mechanic’s version of the F1 workshop, so it’s nice to see other people doing this. For today, we’ll get the brakes fixed and go home, but we will have to continue to work on the truck once we get there, as they pointed out that is also needs air/oil/fuel filters and an oil change, and the engine is running rough so we’ll probably get new fuel injectors as well. I was considering retiring this truck, but since the Big Truck (the Chevy) doesn’t have air conditioning, this is our best vehicle for picking up batteries and solar panels from PAP, so we’ll work on fixing it again. It’s gonna be a busy couple weeks before Jamie, Mara, and Mom get here, but I’m looking forward to it. For anyone keeping track (or trying to), the last 4 months or so have not gone according to our original plans. In our minds, Jamie was going to be in the US for the month leading up to Mara’s birth, and a month afterwards, then she was going to visit Finland so Mara could meet her extended family, and I was going to head back to Haiti. But God had different plans in mind. In the end, our 2 month departure from Haiti became more like 5, but it’s been great, even if my guys back in Jacmel may not be so sure yet. Our Finland plans didn’t work out as intended, so I “had” to travel with Jamie and Mara over there, which was pretty great if I’m honest. I kinda wanted to go all along, but was trying to be fiscally responsible and that her mom could take care of her while she was there. Then, her mom’s plans changed, and some dear friends chipped in to cover the additional costs of me heading over as well. 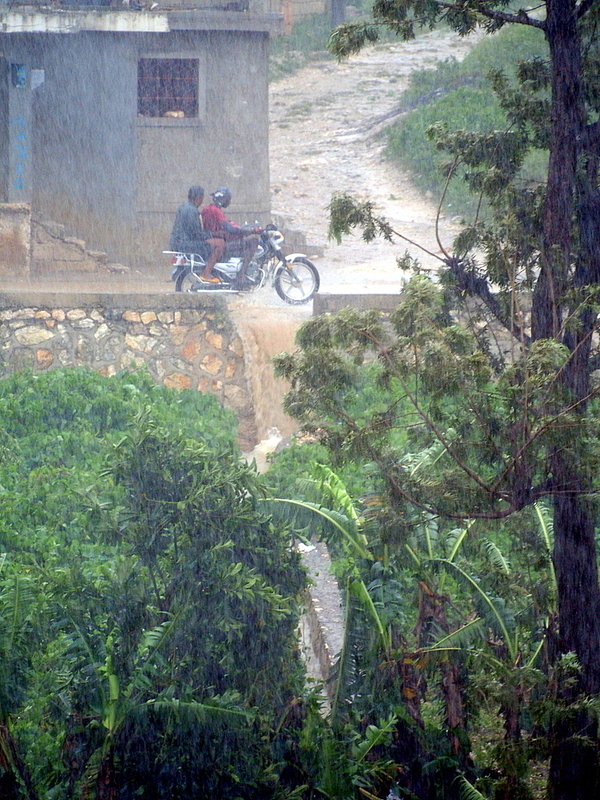 Then, the biggest delays to getting back to Haiti came because God provided our “new” vehicle. 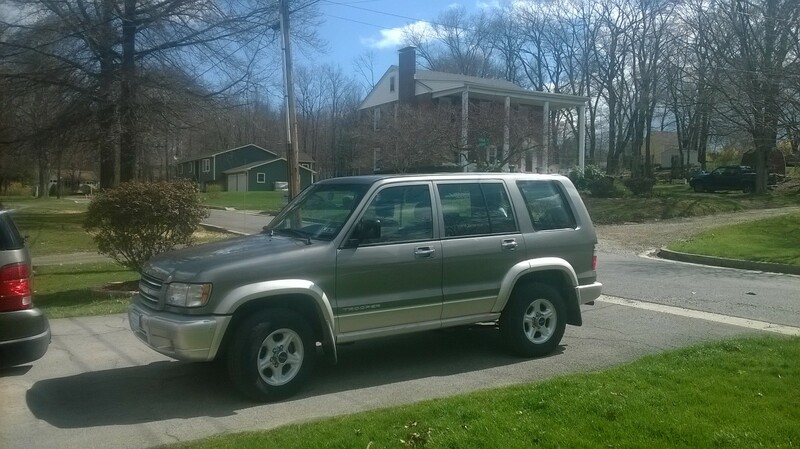 Today, I dropped off our 2000 Isuzu Trooper at the docks, loaded with baby stuff and tools. We didn’t make a big deal about gathering the stuff to put in the truck this time because we realized that we needed to be quite selective with our limited space, but we certainly used up every cubic inch we could safely secure in the back of this thing. And now, it’s time to head back to Haiti. I’m excited (to get back to work with the guys), terrified (about what may have broken while I’ve been gone), nervous (to bring our daughter with us into the most politically unstable Haiti I’ve ever experienced), and relieved (because as great as it was to stay with my parents and catch up with friends, it will just be nice to get “home” and settle into life with Jamie and Mara in Haiti). I’m also ready to move forward again. I’ve been confused about direction lately, and I think it was mostly that I was overthinking things. I wanted to get more involved in discipleship and building a church since they were “more evangelistic” than what I was doing. I felt like I wasn’t doing enough. But you know what? I’m an engineer. And I’m actually a pretty good one. 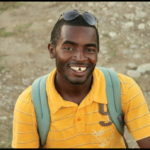 God has put me in a position to learn and grow into a role in Haiti that is quite unique. 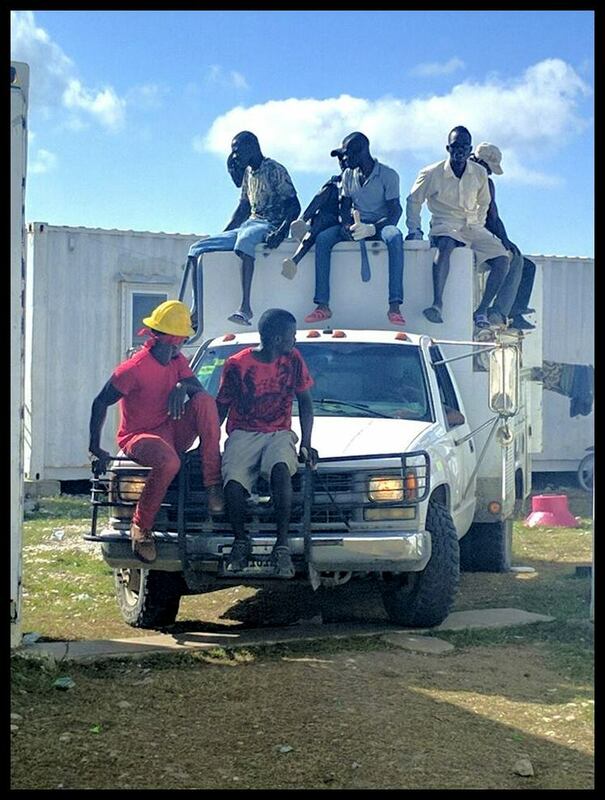 And everyday, I get to work with Anderson, Gayly, Fleury, Waly, and Bouki, and we may even pick up some new people. I’m looking forward to getting more involved in aiding other ministries again. I was getting weary of that. Mostly because of the turnover I’ve seen. We’ve made new friends, only to say goodbye after a few short months. 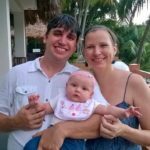 It’s crazy, because I moved to Jacmel to be with the missionaries there, and now there’s only a handful of us that remember what 2011 was like. And for a while, all of that had be growing weary. But you know what, our day to day life is still a worthwhile ministry, even if I was starting to doubt it. It may not be glamorous, but it is good. I am looking forward to getting back to the workshop and working with my guys. 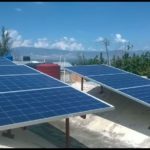 We have more ministries to help, including a few solar setups on the docket, and I’ve got more ideas to try with them so that we can develop their skills, and the technology to help other missions in Haiti as well. And I’ll have a role in New Perspectives Church which Pierre and Lorphene have started. It may not be flashy, but God calls us to a daily walk with Him, taking care of each day as it comes, and I’m ready to continue that journey. 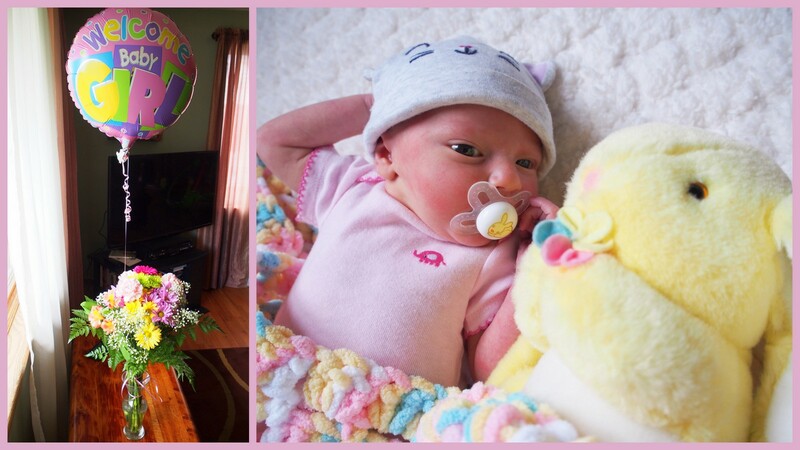 On Monday, April 4th, at 7pm, Jamie delivered our little girl, and now we are blessed and excited to introduce her. Born weighing 8lbs 2 oz and 20 inches long, she arrived after a rather long labor and we are thankful to all of you who were praying for us through this time that God was able to sustain Jamie through the process. Mara has several stories behind it, but it is a name that God put on Jamie’s heart before we even knew we were pregnant. In our minds, Mara is short for “Maranatha”, which was used as a greeting in the early church meaning “Come, Lord Jesus”, reminding all to look forward to his return. It is also a reference to East Africa where Jamie grew up, or specifically, the game park know as “the Mara” (Maasai Mara). Linnea is a good Scandinavian name, but is also a reference to Lynn, which is my middle name as well as my dad’s. As many people have asked what this does to our plans, we will continue to follow where God leads, including the fact that He has lead us to Haiti for this season of life. We look forward to introducing our little girl to her new “uncles” Anderson, Waly, Gayly, Fleury, Bouki, and Daniel. Please continue to pray that God would give us wisdom regarding what work we should be doing, when (and where) we should be traveling, and for favor regarding getting proper paperwork for Mara and (hopefully) letting her and Jamie visit her extended family in Finland.